Working on large scale housing projects requires knowledge and experience. 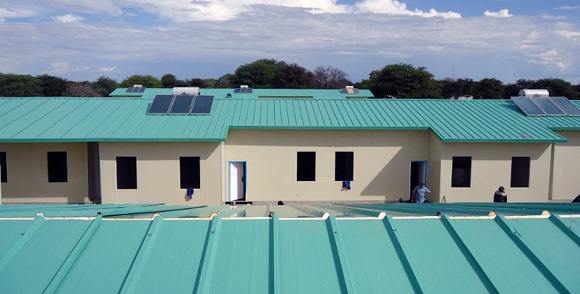 DRM is able to provide cost effective solutions for a wide range housing development projects.Our Multi-Units production line meets building requirements for goverment buildings, social housing, mini-camps, and many more, can be developed on time and within budget. Manufactured from steel sheets welded to a galvanized frame, the hoarding's strength and durability allows it to be used repeatedly whilst requiring minimum maintenance to keep a quality appearance. The panels can be quickly and easily erected, dismantled and moved with pedestrian and vehicle gate options available. This fencing system can be used to create a secure perimeter for sites containing equipment and for even higher security a temporary roadway can be incorporated with access gates for vehicles to patrol the compound. As the fence prevents visibility it is also widely used in and around areas requiring privacy. Pedestrian and vehicle gate options are available and the fence can be supplied in white or blue if preferred with infill privacy panels to fill gaps between panels. Structure: light steel as its main frame, which is safe and reliable; sandwich panels as its roof and wall boards, which is in attractive looks and beautiful decoration. Environmental protection and economy: the prefab house is reasonable in design, assembly and disassembly are simple and convenient, can be recycled many times. Applications: Portable house can be used as permanent & temporary residence, laborers accommodation, office, workshop, warehouse, etc. Advantages: High performance in quakeproof, waterproof, windproof, moisture proof, heat preservation and sound insulation.